Yep… that’s what many professional rabbit breeders say in the beginning; just the same as you. But if you really love bunnies and just can’t spend enough time watching their cute little antics, you should reconsider and visit a rabbit show. They’re fun, friendly, casual events where everyone is welcome and you’ll be surrounded by bunny-lovers, bunny experts, and best of all… lots and lots of bunnies! What is a rabbit show? Just like dog shows, horse shows, and other animal hobbies, rabbit fanciers benefit by attending regular meetings where they can interact with others in their area of interest. Shows are where you find hobbyists and breeders sharing and comparing the best practices for improving their breeds. Because rabbit breeding strives to improve the rabbits’ ideal characteristics in each successive generation, competitions help identify the most desirable traits and reward the breeders who have developed rabbits to that “standard of perfection.” Rabbit shows are usually organized by local rabbit clubs, 4-H clubs, or rabbit “specialty” clubs that emphasize breeding and showing of a single particular breed. Shows are frequently sanctioned by the American Rabbit Breeders Association (ARBA), and almost all use the ARBA guidelines for their judging, scoring and rule administration. Admission is free and shows are open to the public. They’re family-oriented events where children are as numerous as adults, and the atmosphere (while somewhat chaotic) is very relaxed. How are rabbit shows organized and judged? The host club or organization generally pre-registers participants for a show and organizes the entries into several categories. 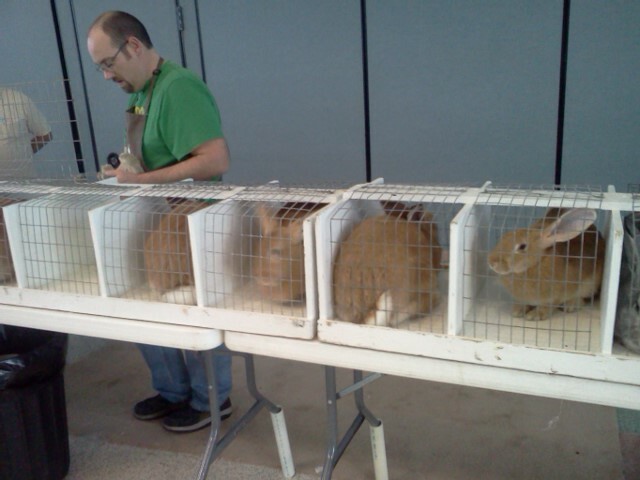 Rabbits are first divided between a “Youth” category, for participants under age 18, or “Open,” which can be entered by any attendee. Within those categories, the rabbits are then separated by breed. A minimal charge ($3–$4 per rabbit) is collected when signing in. When judging begins, all the rabbits in a single breed are called to the table. Each rabbit is placed in a holding box along the judging table where it will wait to be reviewed. An ARBA-certified judge or other qualified professional will assess each rabbit based on the criteria set forth in the ARBA Standard of Perfection for that particular breed. The best male and female of each breed are identified and awarded some cash or testimonial prize. A point system for ARBA members also awards points (called legs) for winning rabbits. These count toward awarding Grand Champion status to excellent specimens of the breed. Yes, but how does this benefit me as a pet-rabbit owner? Rabbits are deceptively complex animals that require some particular knowledge and experience to keep healthy, happy, and prosperous. Did you know that Belgian Hares require special flooring? Do you know how often your Angora should be groomed? Did you know there are forty-seven recognized varieties of rabbit in the US alone? While attending a rabbit show you’ll meet both breeders and industry experts who can help guide and mentor you about your particular rabbit breed. Open discussions help you determine the best type and amount of feed, hay, and water. Preventative and remedial medical treatments are shared to address bunny’s health concerns. Special products and equipment are often sold at shows that can be difficult to find at pet stores. Many breeders sell their baby rabbits exclusively at shows, so the best quality animals are often found only at these events. The items, knowledge, experience and enjoyment you can find at rabbit shows certainly exceed what could be listed here. How do I find a show in my area? Now that you’re convinced you want to attend, how do you begin? We recommend you begin at the ARBA website. You can review a list of shows in your area that have been sanctioned by the association and listed in their records. This is referenced by state, and can be found at https://www.arba.net/showsSearch.php#showsearch. You can also find information on shows featuring your particular rabbit breed by visiting that breed’s national specialty club site. Again, start at the ARBA site and find your unique breed. https://www.arba.net/breeds.htm From this page, simply click on your rabbit’s image and you will be linked to that specialty club’s site, where you can use their own show-search listings. A quick call or email to the show secretary listed for the event should put you in touch with the best possible person to help you on your way. Of course, if you’ve purchased your rabbit from a professional breeder, or know one in your area, they’ll almost certainly be able to assist you in taking the first step toward attending a show. Makes me want to go to a rabbit show !